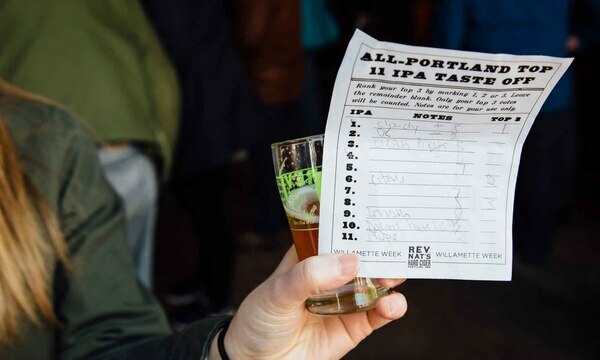 We Tasted Damn Near Every IPA in Portland in a Blind Tasting. These Are the 10 Best. When it comes to craft beer, IPA is king. In the 22 years since Portland's BridgePort invented the American IPA, the hop-crazy style has become a craft-beer juggernaut. Today, more than half of all craft beers ordered in America are hoppy pales. At Willamette Week's Oregon Beer Awards being held this week at Revolution Hall, no categories received more entries than IPAs. But the past few years have seen huge changes. Bitter, dank, piney IPAs have been replaced by a new breed of citric, tropical and yeast-hazed brews. The best IPAs brewed today bear almost no resemblance to the ones brewed even three or four years ago. This week, we publish our glossy annual WW Beer Guide (available for free all over the city)—a survey of the best breweries in the state. We thought there was no better time to revisit the new Portland IPA, and follow up on our ranking of IPAs in Portland from two years ago. 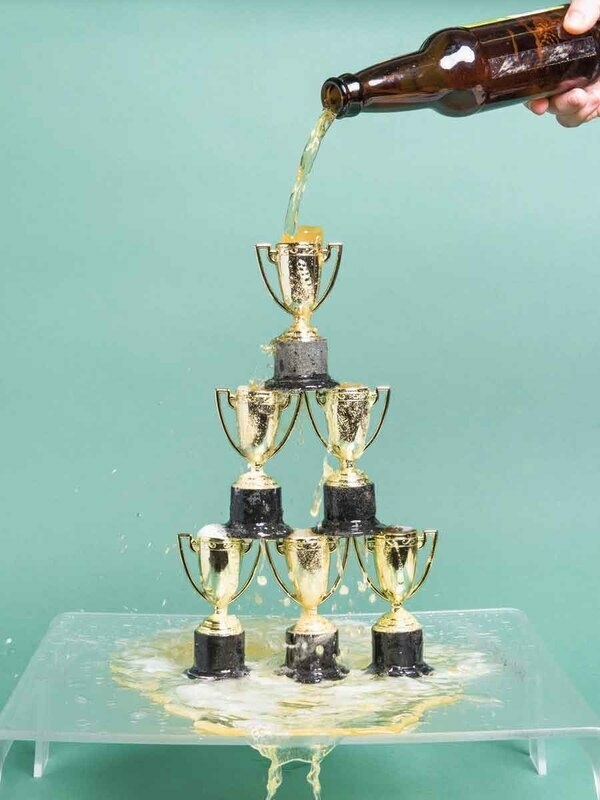 This time, we collected damn near every IPA brewed in Portland in February—115 in all—and chose the top 10 in a blind taste test of eight beer pros. We then invited the beer lovers of Portland to the neutral ground of Reverend Nat's to try the top 10 IPAs in the city—and to vote for their favorites. Here are the top 10 IPAs in Portland. Back in 2016, when Northeast Alberta's Great Notion Brewing landed two IPAs among the top 10 in Portland after WW's massive blind tasting of 73 Portland IPAs. The beers looked like orange juice, and tasted a bit like orange juice—a world of tropical fruitiness, yeasty haze and low bitterness that more traditional brewers refused to recognize as real IPA. Now, a win by Great Notion almost feels like a foregone conclusion. In the two years since Great Notion inaugurated the hazy New England IPA in Portland, the cloudy beer wars have been fought and won. A hazy IPA is Portland's favorite IPA in town, and that hazy is Great Notion Ripe—the same beer that won fifth place in 2016. Except it's not quite the same beer. For much of the first year of its existence, Ripe was a slightly different beer almost every time you tasted it. "The idea with Ripe originally was that it was an ever-evolving beer, almost like fruit on a tree," says Great Notion co-brewer James Dugan. "Eat it young it's one way, eat it later it's different. Ripe was an expression of fruit in different stages—we had all kinds of variations, different hoppy varieties." Ripe has settled into a beer devoted to only one hop, Citra. When added late in brewing to offer up its aromatics rather than its bitterness, it's one of the juiciest and most single-mindedly fruity hops in existence. It's like P.O.G. in a nugget. Ripe tastes amazingly, aggressively, almost impossibly juicy. 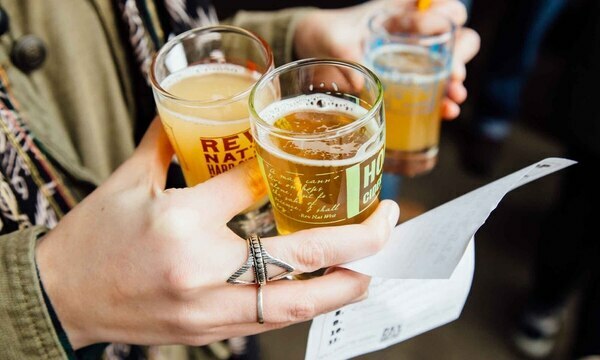 In both our panel judging and the public tasting, many tasters refused to believe fruit hadn't been added to the beer, including some of the finest beer palates in Portland. "Amazing fruit adjunct beer," wrote one commenter. But according to its brewers, it's all hop—and a little bit of chemistry. "Part of it is the way we treat our water," says Dugan. "We have a unique approach on mineral additions and pH. Look at the type of water in Portland. It's almost like distilled water, it's incredibly soft. It's like seasoning our food; we build our water back up with minerals that are absent." They've also added more hops to their beers—a stunning 4 pounds a barrel, doubling the number of hop additions, and adding two-thirds more hops each time. "Call it two-thirds double dry hopping," says Great Notion co-brewer Andy Miller. Ripe was an amazing beer when it was first made, but it's evolved into a fruity cornucopia of epic intensity, a candied IPA so creamy and fruity it almost shoots off into its own category of beer. But Dugan insists that under that intensity, the fundamentals remain sound. "We didn't change the station," he says. "We just turned up the volume." MATTHEW KORFHAGE. Thirty-five years into building a beer empire, McMenamins isn't a just a brewery anymore: It is legion. Oregon's largest and oldest beer chain contains multitudes of breweries, each with its own specialty beers and one-offs, and each with its own exclusive IPAs. Mike and Brian McMenamin's five Portland breweries are like independent brewpubs that all devote multiple taps to their own obsessions alongside the classic Hammerhead and Terminator and Ruby: The nine McMenamins IPAs delivered to our office included not only one of the lowest-voted IPAs in town but one of the best. At the Kennedy School, brewers Brian Riley and Ryan Lund work schedules like firemen—four days on, four days off, with only one day they're both in the same room together to collaborate on brews. Lund's brews at West Linn were already some of the best I'd had from McMenamins before he joined Riley there this November. 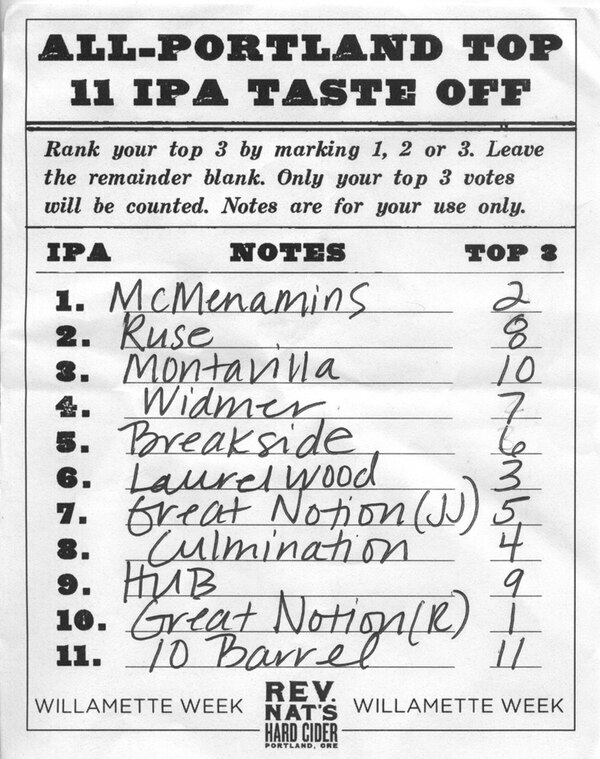 And 33rd State, the IPA they made together with Riley taking the lead, is the best IPA we've ever tasted at a McMenamins. Though not hazy, it can read a little hazy—the McMenamins breweries don't filter—but the hop haze is something both Riley and Lund prize in the beer. "We figured we'd make something different," Riley says, "marrying Cascade—the long-standing hop of the West—together with Amarillo and Equinox that have grapefruity flavors…then with this we put Citra and Mosaic into the dry hop, the new hops everybody loves." The result is a beer of uncommon balance and sturdy malt backbone, giving way to so much fruit flavor it's like a peach gone squishy in the sun. That mix of old-school and new school IPA flavors made it extremely popular in our blind tasting—no one didn't like it. The public obviously agreed. Riley and Lund sell more of their IPAs than even the McMenamins classics, and their last 12-keg batch of 33rd State disappeared almost immediately after the brewers made it—even though it distributed only to Kennedy, Chapel Pub and St. Johns. They'll make one more batch for the first week of March, and then it might not return for quite a while. "We brewed quite a few IPAs, probably 20," says Lund. "We're trying to keep ourselves from getting carried away—nail down a consistent recipe so people can come back and get the beers again." MATTHEW KORFHAGE. Family-friendly brewpub Laurelwood can be a little like the Workhorse IPA that pays its bills—and which also made its way into our top 10 two years ago. It's a reliable Portland staple, so familiar you sometimes forget to notice how good the brewers are at their jobs. But when it came time for them to jump into the haze game with their very first New England-style IPA, things didn't go exactly as planned. "At first, we struggled to actually make this beer hazy," says brewmaster Cameron Murphy. "It wasn't until probably our third batch that we finally achieved an acceptable level of haze." "Not only does making a hazy beer go against everything that we've been trained to do as brewers," adds head brewer Eric Ebel, "but our system is designed to make our beers as clear as possible." What started as a fun, one-off project turned into a bigger undertaking that required four batches and some advice from other brewers. They had to change the malts they used, and then tried replacing the popular Mosaic hops with more accessible Amarillo hops, alongside an additional balanced trio of Galaxy, Equinox and Citra hops. "Drinkability was the most important thing for this beer" Murphy says, "We wanted something that could be sessionable, something that people could drink a few in one sitting." "And we didn't want it taste like you were just chewing on hops," Ebel chimes in. Kids These Daze is definitely drinkable. It's bright gold with just enough haze to keep it in the category, and the aroma screams of juicy oranges and pineapple with a splash of passionfruit—a well-balanced flavor that doesn't smack you in the face with bitterness. It's a hell of a beer. SHANNON ARMOUR. It can be hard to taste the same Culmination beer twice. While a lot of breweries go hunting for their next big flagship—finding one thing that works and sticking with it until it becomes stagnant—the 2-year-old Kerns brewery is always finding ways to sate the beer geek's need for shiny new things, whether vegan and Indian pop-ups at the brewery or a raft of new beers. We'd expected to see Culmination's Obscured by Clouds IPA at the tasting—the brewery's rice-adjunct hazy we'd called one of the very best of a bumper crop of Portland New England IPAs. Instead, a previously unseen Interstellar Voyage promptly showed up at our door—and it quickly shot up into our top 10 in the blind tasting. Small wonder: Culmination's non-hazy flagship Phaedrus IPA didn't fare as well this time, but two years ago we ranked it fourth-best in the city. Interstellar Voyage, however, relies on an entirely new formula, says Andrus. The idea, he says, was to use a base beer with a light body and then "just dry hop the hell out of it." That base beer got overhauled with a new grist build that included wheat, 2-row and a type of malt Andrus says he normally avoids: Crystal, which Andrus says can cause beers to taste oxidized. But Crystal 15 is "barely a Crystal," he says—so he tried it out to amp up the crispness to set off naturally fruity New Zealand-grown Nelson hops, and a smattering of popular, lightly tropical Mosaic and Galaxy hops to round things out. "Nelson hops just make sense normally," Andrus says, "but this is the first time we've actually used them in an IPA." The result is an intensely juicy beer that drinks smooth and bright, with tons of citrus and tropical fruits on the nose and traveling across the palate, with just a touch of pine and a slight bitterness. As with all its one-off beers, it's a mystery whether we'll see Interstellar Voyage again after this batch, but it may just be because the Culmination team has something bigger and better up its sleeve. "We're going to keep making hazy IPAs because they're fun to make," says Andrus. "If we're not having fun, then we're doing something wrong." SHANNON ARMOUR. Juice Jr. is a phenomenon. By the time WW named Great Notion's original flagship our 2017 Beer of the Year, the Mosaic-hopped beer had already all but taken over the Portland beer conversation. It was the first New England-style hazy IPA brewed and sold in Portland, modeled on the famously cloud-soft and fruit-forward beers of the Northeast like Treehouse and Trillium. If the Portland IPA palate has moved away from dank and piney bitterness to a new and softer profile, Juice Jr. is a big reason. Two years ago, when Juice Jr. was voted the third-best IPA brewed in Portland, Great Notion's two beers were the only two hazy beers in the city. This year, we tasted 37 of them. Though a mere 6 percent ABV, Juice Jr. is a monster beer when it comes to both roundness and flavor. As with Ripe, its brewers have massively increased the amount of hops they use, to make it both more floral than a Tchaikovsky score and more tropical than deepest Brazil. It's quite possible that on any other day, Juice Jr. would have been voted next to Ripe as the top two beers brewed in town. But while the pillowy, near-creamy wallop of Juice Jr. still placed it high in the rankings, some tasters noted a brewing flaw in the batch we tapped at Reverend Nat's, something we hadn't tasted from the brewery before—a tinge of buttered-popcorn flavor, which some are extremely sensitive to and others don't taste at all. And even that batch was voted the fifth-best IPA in the city in a blind tasting. Perhaps no other beer in Portland could do the same. MATTHEW KORFHAGE. Most session IPAs seem thin—like butter stretched over too much bread. But ever since Breakside Brewing made its first batch back at its Milwaukie brewery at the beginning of 2015, Lunch Break ISA has been a wild exception. Even at a puny 4.7 percent alcohol content, it's a full-throated, full-bodied roar of hop flavor. Still, amid flagships like Wanderlust and What Rough Beast and Breakside IPA—perhaps the most belaureled beer in the state—Lunch Break slips through the cracks. "It's always been fifth fiddle," says Breakside brewmaster Ben Edmunds. "[But] it's one of my personal favorite beers, a real gem in our portfolio." The key to its success is that Breakside brews their session IPAs just like the big boys, rather than scale everything down the way some breweries do. But it's also a matter of paying attention to what hops do in lower-alcohol beers. "When you dry hop with a lower ABV environment, you pull more polyphenol, more grassy herbal character," Edmunds says. 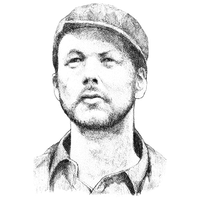 "Nerding out on specific oil profiles of hop varietals can make a real difference." Starting with fruity, earthy Simcoe hops known for their complexity, Breakside added a bunch of tropical fruity-tasting hops from New Zealand and Australia: Galaxy, Rakau and Azacca. 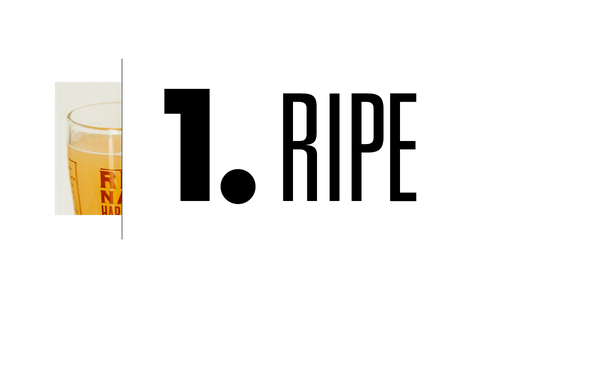 It's a low-alcohol IPA with surprisingly full mouthfeel, and a massive hit of aromatics—enough to make it the only hoppy Breakside beer to win gold in its category at both the Great American Beer Festival and the World Beer Cup. Lunch Break is typically brewed in Milwaukie alongside the other year-round Breakside standbys—which means Wanderlust and all the others weren't eligible for this taste-off. But as an experiment, Breakside tried out Lunch Break this year at its brand-new two-story Slabtown brewpub around the corner from the New Seasons. Though Edmunds thought the Portland batch was "a little drier" than he would have liked—perhaps less preferable to the ones the brewery makes in Milwaukie—that also made it eligible for our beer tasting. It turns out even a sixth-fiddle Breakside IPA is still one of the best in Portland. MATTHEW KORFHAGE. Though it isn't as gnarly as a sweat-stained leotard, Widmer's Oh Yeah! IPA is big and burly as far as IPAs go. A 7 percent ABV hop bomb that used flowers in every step of the brewing process—from mash to fermenter—Oh Yeah! is, at its core, a modern homage to the dry, crystal clear West Coast IPAs of five years ago. It's also a nod to Macho Man Randy Savage. Founded in 1984, Widmer is one of the oldest breweries in Portland, But at age 45, brewer Thomas Bleigh is the self-proclaimed "grandpa" of Widmer's small-batch innovation brewery—a hotbed of beers that'll turn out 144 unique brews this year. When he decided to throw down against his two younger colleagues in a competition to make the best possible IPA, his thoughts went straight to the prince of the pro-wrestling smack talkers. "The beer should have the aroma and the characteristic of Macho Man Randy Savage after he got out of a wrestling match," chuckles Bleigh of his original target. "It was also modeled after an old quote of his that was really ridiculous: 'Too hot to handle, too cold to hold. I wanted to make a beer that was gonna be so good that you couldn't hold onto it—you were gonna wanna drink another one." A blend of Simcoe, Mosaic and Amarillo were added just before the beer hit the fermenter, providing a thick blanket of tropical citrus (and a hint of sweaty passionfruit funk) in a beer with a clean, dry finish. "What's different about this beer to me is that it plays into a lot of old IPA characteristics but amplifies it for a more refined palate," says Bleigh. To most Portlanders, Widmer is hefeweizen, the ubiquitous American take on hazy wheat the Widmer brothers invented more than 30 years ago and placed on seemingly every old-guard bar tap in Portland. But with Replay two years ago—which ranked No. 10 in our blind test—and now Oh Yeah!, Widmer is also one of the city's best makers of hoppy ales. If he puts out another batch, Bleigh figures he can put Oh Yeah! on the top rope. 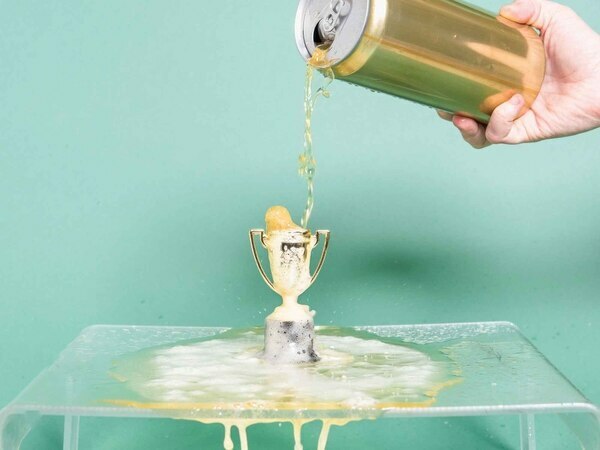 "The first five times I had that beer I loved it," he says, "but I still think I can do better." PARKER HALL. If it weren't for a split-second decision by Ruse Brewing founders Shaun Kalis and Devin Benware, Ruse's crystal-clear Way With Words would be yet another of the hazy hop bombs taking over Portland. The beer was originally meant to be an experiment laying powdery Kölsch yeast from Germany onto a New England IPA base. But a quick gut decision on the brewstand had the two throwing in a dose of crisp, light, dry California ale yeast. "We love New England-style IPAs, but sometimes it's so chewy that it's hard to drink multiple in a row," says Kalis. "We love that this beer is so crushable." Dry and drinkable, Way With Words goes down as breezily as a summer thriller. The clean, quick-clearing yeast chewed through all the flashy framework that would normally have formed a juicy East Coast hop bomb—pillowy calcified water, a heavy dose of oats, and massive late additions of Mosaic and a lesser-known hop called Cashmere—to create an invigorating hybrid with gorgeous notes of citrus, overripe mango, and a sprinkle of bitterness on the finish. Last-minute inspirations are common for the pair, who've been brewing out of Culmination's brewhouse just north of Sandy Boulevard for two years, and will soon open their own brick-and-mortar location in Sellwood. "I think the next step in this whole progression of the IPA is going to be this new thing," says Benware, "It's not going to just be this hazy thing." The IPAs of the future, they think, will pair modern New England hopping rates with dry and drinkable beers. A recent batch also saw the pair using both New England IPA yeast and West Coast ale yeast in a triple IPA made for hop haven N.W.I.P.A. "We're going to just start calling them all IPAs," says Benware of Ruse's future hoppy ales. "We might drop the 'New England' or the 'West Coast.'" PARKER HALL. The path to Destroyah started with a Belgian-style Pig War. Christian Ettinger, founder of 11-year-old bike-friendly Powell Boulevard brewery Hopworks, always liked a 2012 white IPA they brewed called Pig War, inspired in part by Belgium's Poperinge hommelbier. He refers to the beer as a "magical combination of wheat and hops." 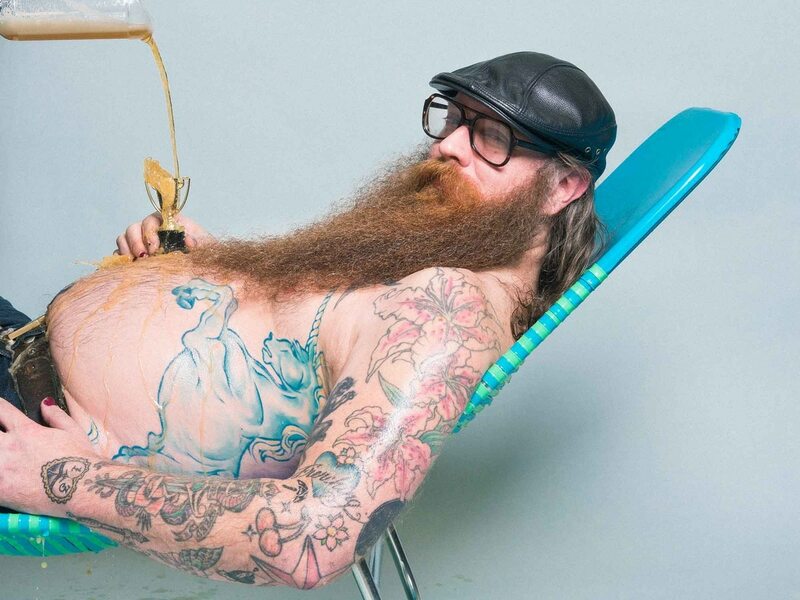 That was before hazy beers took over the Portland brewing landscape. With a wheat and oat base, Destroyah amps up Pig War to a massively fruity New England-style IPA with a blast of fruit flavor—mixing homegrown Simcoe with new-school tropical hops from New Zealand called Wakatu and Ekuanot. Destroyah is like a passionfruit smoothie, redolent with malt and fruit aromas—and at 6.6 percent ABV, it's perilously drinkable. "There's something magical about the haze that drives hop flavor," Ettinger says. "The nucleation sites [proteins in the haze] seem to be a nice place for the hop oils to grab on." One's tongue is also a pretty chill place for them as well–and Hopworks will be pushing out six more hazies this spring. But Destroyah destroys most every IPA in town—and it's available in 16-ounce cans at your local supermarket. Make sure to check the sell-by dates: You want this one fresh. Nonetheless, we were curious about the beer's name. Ettinger smiled and pulled up a Godzilla video on his phone. "Because Godzilla is cool," he says. "We like flame-breathing monsters." DON SCHEIDT. 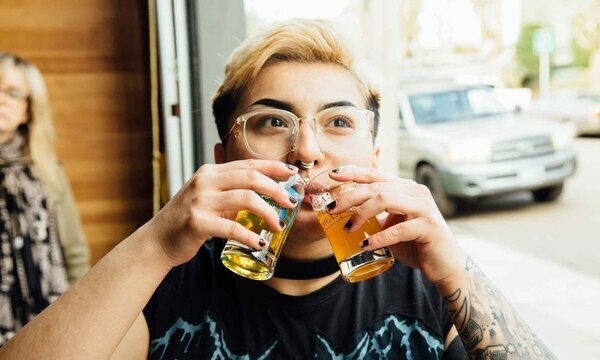 Most West Coast IPAs are not great food beers—an aggressive stew of citrus aromatics, dank diesel and a bittering pine blast that car-bombs your palate. But Montavilla Brew Works' East Glisan Mosaic is both fruity and delicate, the rare balanced IPA with a malty backbone that doesn't distract from its tropical Mosaic hops. Brewer Michael Kora brewed the IPA as the house beer for East Glisan Pizza just blocks from his Southeast Stark Street brewery, where it will be served alongside the city's best saucy, meaty, cheesy, thick-crust Detroit-style pies every Tuesday and Saturday. Kora had already collaborated with several local businesses on special beers, and he'd already met the East Glisan Pizza owners at a neighborhood business association meeting even before the former homebrewer started Montavilla Brew Works in 2015. East Glisan was inspired by a popular seasonal fresh hop beer that Kora brewed in 2017 called Tangled Up in Hops. "We basically brewed a non-fresh hop version of Tangled," says Kora. 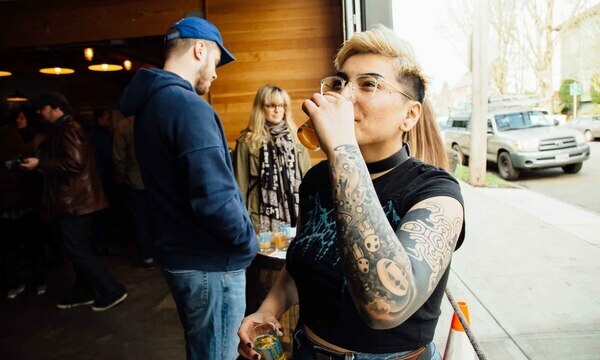 The result was one of the best new IPAs in Portland this year—a result that shouldn't be surprising given that Montavilla's Flam Tap IPA was voted as one of Portland's top 10 IPAs in WW's all-Portland blind tasting two years ago, when Montavilla was only 6 months old. East Glisan takes some of the old-school notions of backing up an IPA with a chewy malt base, but goes new school with the super-popular Mosaic hop variety and more finishing hops for heavier aromatics. "East Glisan Mosaic IPA has a way different flavor and aroma of mango, dank herb and berries," says Kora. "People who like Mosaic hops really like this IPA. We really like it too." EZRA JOHNSON-GREENOUGH. In Ex Novo's seasonal hazy take on its flagship Eliot IPA, which ranked No. 6 in our tasting two years ago, tasters praised the beer's tropical and melon notes—stemming from a super-tropical mix of late-hopped Galaxy, Citra and Mosaic. Notes: "Savory, herbal, very unique." "Melon with cream…how do you do that?" "Whoa. Citrus zest. Some tamarind candy." Great Notion, but Galaxy instead of Citra or Mosaic. We liked that, too. Notes: "Sweet, juicy, ripe." "Pineapple, mango, papaya." Level's Trump-themed hazy—"cloudy, like his judgement"—turned out classy and tremendous. This shouldn't be surprising, given that Level's brewers are the former heads at Ex Novo and Laurelwood. One taster was convinced it was, in fact, Great Notion's Juice Jr.
Notes: "Juice Jr." "Smooth, rounded hoppiness." "Nice and soft, long finish." "I swore I'd never make a hazy beer," Harper tells WW. But last fall, Portland Deschutes brewer Jake Harper broke down and made his first pub-only hazy—a mix of Idaho 7, Mandarina Bavaria, Azacca, El Dorado and an experimental variety called 431 that tastes like peaches, it's been the most popular beer in their taproom. Notes: "Grapefruit peel." "Soft and pillowy, cloudy, smooth finish." "Traditional in a hazy suit." Old Town is a sneakily good brewer of IPAs; its Shanghai'd won a Great American Beer Festival gold among English-style IPAs three years ago, but that Englishy maltiness kept that beer out of the top slots. But we praised the balance in this Upper Left—a mix of Columbus, Cascade, El Dorado, Rakau and Mosaic hops—though some tasters detected what they thought were brewing flaws. Notes: "Nice and balanced." "Pretty good." "Burnt caramel." Like we said, Old Town is a sneakily good brewer of IPAs. This mix of Columbus, Nugget, El Dorado, Cascade and Amarillo was a bit of an experiment—the brewery aimed for a sort of "fruity-piney" thing. That's what it got. Notes: "Spicy, earthy, toothsome and reckless." "Fruity, but not too much." In some ways, this was our favorite high-shower in the tasting—an IPA made with a cannabis protein designed for a stoner-metal festival. The hemp flavor was pronounced, leading to both lovers and haters. Notes: "Diesel, OG Kush, but actually pretty nice." "Dank, weedy. Hemp. All the marijuanas." "Dank! Earthy. Upfront bitterness, smooth finish." "Cannabis kills the hops." Royale resisted making IPAs for the first two years of its existence, before spending all year going through a round of betas. Well, turns out it was worth the wait—with aromatics balanced in a heady stew of Amarillo, Azacca, Idaho 7, Mosaic and Meridian hops. Our tasters found it balanced and pleasant, though one thought it was a brazen play for the middle of the market. Notes: "Clean, fresh, balanced." "Very soft and pleasant." "Classique IPA." "OK, I get it…probably sells well." San Diego-based Modern Times had just one Portland-brewed IPA on tap that fit our criteria for the tasting—an intensely fragrant, lightly hazy Orderville mixing Mosaic and "dank hops." Tasters liked the balance—or found the balance boring. Notes: "Mosaic blended, good job. Finishes like a gin and pineapple with the warmth." "Classic and flawless." "Wide range of hops. Balanced/boring." "Dank—touch of Mosaic?" This was a weird one. Made with Bravo, Chinook, Cascade and an experimental hop known only as 0207, Alameda's IPA tasted like bubble gum, an intentional product of how the brewery treats its water. Notes: "It's the zebra with colorful stripes. Fruit Stripe gum." "Bubble yummy." 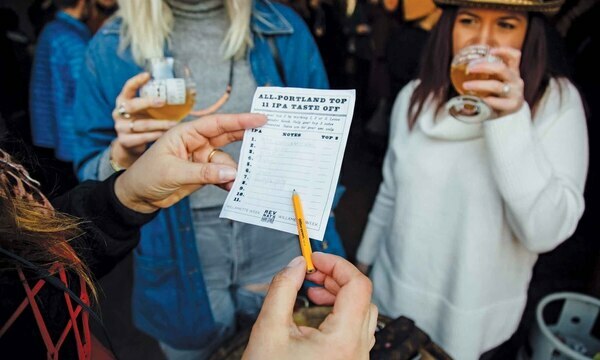 This Portland-brewed entry from 10 Barrel easily won its way past its competitors in an eight-brew wild-card tasting—earning a berth as the 11th tap in our top 10 tasting. Nonetheless, the clean, lovely, lightly hazy beer did not manage to crack the top 10 at the public taste-off. In a flight of hop monsters, some tasters wanted the hops to be a bit more aggressive. Notes: "Golden, smooth." "A little malty—not much hop." "Hazy but piney?" Methodology: In the two days leading up to Feb. 15, we collected 115 IPAs brewed in Portland. (There were a few IPAs we couldn't taste, including Pono, Moonshrimp and Scout.) Only IPAs brewed within Portland city limits were considered, and we excluded IPAs outside the range of 4.5 percent to 7.5 percent ABV. In addition, we excluded heavy fruit additions, sour IPAs and Belgian yeasts because the different flavor profiles would make comparison difficult. 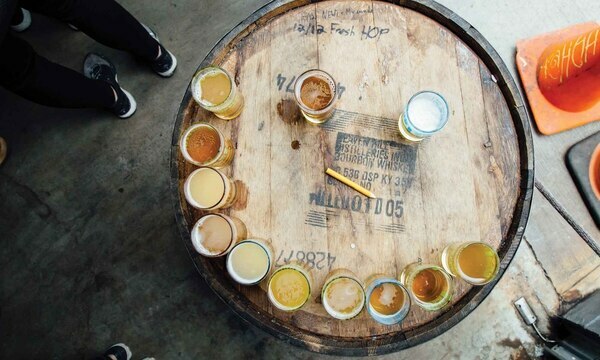 Our panelists ranked each beer on a scale of 0 to 100, and offered tasting notes on each. The top 10 beers from that tasting, along with a wild-card brew from a smaller tasting, were then sent to a blind public taste-off at Reverend Nat's. Voters ranked their top three beers, which were then scored as follows: 5 points for first, 3 points for second, 1 point for third. Was the process flawed? Of course it was: Any tasting that large leads to palate fatigue and maybe a little drunken tetchiness. But we also note that three of the top four beers chosen by our original panel and the people's choice were the same. Tasters in the original blind panel: William Murnighan and Nick Rivers of Bailey's Taproom, beer writers and certified beer judges Don Scheidt and Brad Bourque, NWIPA owner Jackson Wyatt, Nicole Kasten of Beer Connections, former beer editor Martin Cizmar, and cidermaker Nat West. Were you at the taste test at Nat's? Here's a key to which beers were which on the blind taps.